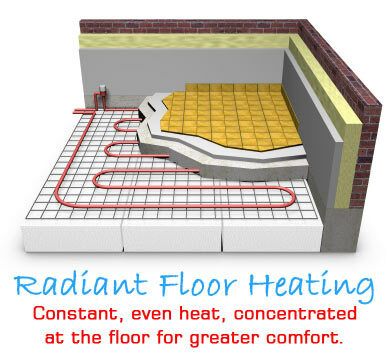 Infloor radiant floor heating is incredibly useful, comfortable and environmentally friendly when designed and installed correctly. When installed incorrectly, however, it can be uncomfortable, inefficient and lose its environmental friendliness. Evans Heating & Cooling recommends and installs INFLOORBOARD. INFLOORBOARD is a thermal mass flooring system that is designed to be installed on top of a subfloor application, but can also be used on top of a concrete slab, as long as the slab is sealed from moisture penetration. Infloorboard is constructed of a dense composite board covered with aluminum that spreads the heat evenly and quickly. Infloorboard heats rapidly and is easy to control, providing quicker response times than standard concrete or gypcrete systems. It contains enough thermal mass to be effective, but not so much that it’s difficult to control. Infloorboard is only 5/8" thick which allows for installation on an existing floor with minimal changes to existing floor heights making it ideal for renovations and projects that did not consider radiant initially. No other product combines the performance, ease of installation and cost-effectiveness of Infloorboard™.